From newborn sessions to etsy product photography shoots, Logan Square Studio is the perfect spot for natural and strobe lighting. The 800 square foot studio is optimized in two very different areas to accommodate just about every photography need. 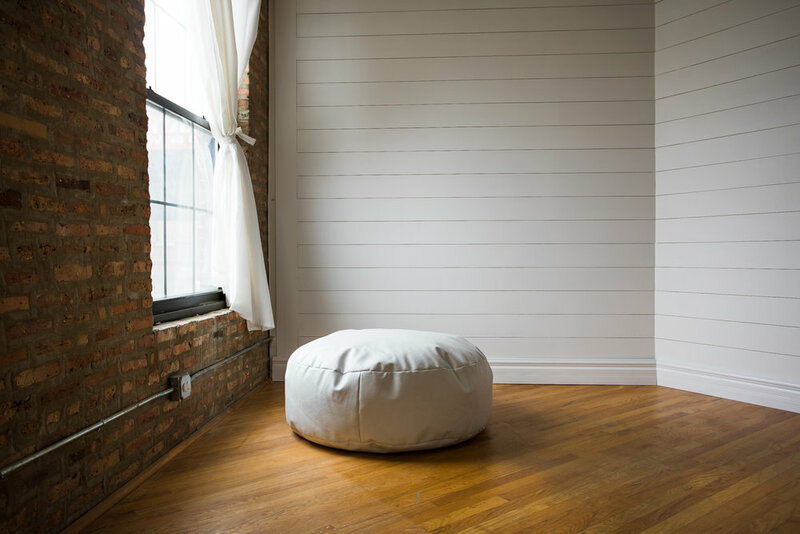 The natural light studio has shiplap white walls, exposed brick and honey hard wood floors. The studio rental includes use of 9 ft paper sweeps. The office and meeting room can be enclosed to cut out all natural light for complete lighting control. Like most small business owners, the photographers at Logan Square Photo, want to do their part to help their community and neighborhood. That's why 50% of the proceeds for all studio rentals will be donated to area non-profits. Have a favorite? Include it in your rental inquiry and we will add it to our rotating list! BYOL (bring your own lights!) or you can rent equipment for an additional fee and additional insurance. The rates listed above are for weekdays only. The studio is available to rent on the weekend for half day and full day only. Please include how you would like to use the space, how many people will be in the space and any questions you may have.